Notes: Bourne Bridge was one of four intermediate stations on the main line of the Newmarket & Chesterford Railway, opening with the line on 4 April 1848. I was sited 400yd south of the bridge over the River Granta and one mile west (nearly 2 miles by road) of the village of Great Abington and 1½ miles north-east of the village of Pampisford. Some early documents refer to Bourn Bridge but Bourne is the spelling that was generally used. 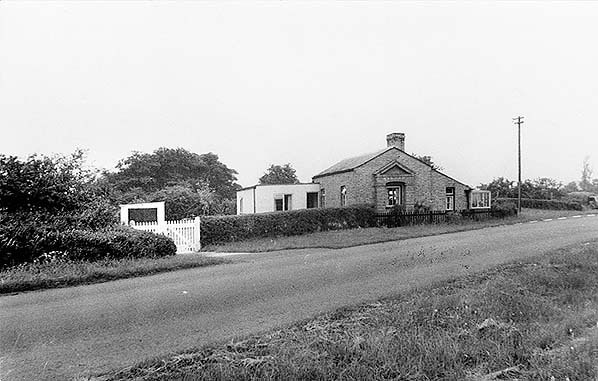 The station was on the north side of Pampisford Road where the crossing keeper’s cottage was also used as the station building. As built, the line was twin-track. It is not known if the station had platforms; if it did they would have been short and low. The two intermediate stations on the Six Mile Bottom - Cambridge branch did have low platforms but these stations were built four years later. Trains stopped only by request. All the crossing keepers’ cottages were built to the same design comprising a single-storey rectangular brick cottage with a pitched slate roof and a cat-slide on the side away from the rails. The entrance to the building, facing onto the road, was decorated with plain pilasters and a pediment. Those cottages that also acted as stations had an external ticket window on the south-west corner of the building facing the track. The booking office comprised a small room formed by the partitioning-off with wood of a corner of a larger room and was located just inside the entrance door on the left. The station closed on 1 July 1850, but when it reopened on 9 September 1850 it was re-sited 400yd to the south adjacent to an identical crossing keeper’s cottage on the north side of what was to become Station Road. The station was said to have been re-located to be nearer the coach roads of the time. The new station was very short-lived closing on 9 October 1851. The re-siting of the station is not confirmed by any of the limited N & C company records that have survived and have been seen during the extensive primary research for this feature. Early company timetables however show the distance between Great Chesterford and Bourne Bridge as 5¼ miles, while later timetables show it as 5 miles. Both sites are shown on old maps reproduced below, although these maps were both published after the line had closed and the track had been lifted. The first edition 1" OS map is too early to show the line and the second edition is too late. The locating of the ticket window at the first site is compelling evidence that there were two sites. A number of sources state that the N&C had a station named Abington, in some cases a passenger station and, in others, a goods station. At this point it is worth mentioning that the GER Abington station which opened on the Stour Valley line on 1 June 1865 (renamed Pampisford 1 May 1875) should not be confused with any N&C station in the vicinity. All references to an N&C Abington station point to what was, in fact, the first location of Bourne Bridge station. Surviving timetables covering the 1848- 50 and 1850 -51 periods of operation all name the station, at both first and second locations, as Bourne Bridge. Surviving company records also make no reference to an 'Abington' N&C station. The supposed existence of an Abington N&C station appears to have arisen as a result of confusion from the contents of an Eastern Counties Railway document of 1853 in which are detailed forwarding arrangements (for goods) to locations not then - or ever to be - served by the railway network. The document also includes arrangements for goods formerly handled at the Six Mile Bottom to Chesterford section intermediate stations, which had already closed. There is an entry for 'Abington' which appears to be the source of the 'Abington N&C' claims, but detective works tells us that this actually refers to the village known today as 'Abington Piggots' near Royston and thus is nothing to do with the Newmarket & Chesterford Railway. The same document states that Bourne Bridge traffic was to be forwarded via Chesterford. It is interesting to note that Abington Piggots, previously Abington by Shingay, was once named simply 'Abington' but gained its later name for the very reason of avoiding confusion with Great and Little Abington - the two villages close to Bourne Bridge. Following the relocation of Bourne Bridge station further south - as evidence suggests, in 1850 - it is reasonable to suggest that the original station was used for goods during the final months of the line's existence. However, no evidence survives to support this theory and no goods services are listed for Bourne Bridge. It is more likely that, following Bourne Bridge station being relocated south the original site, it simply became a crossing keeper's cottage. Following the opening of the Great Eastern Railway's Abington station, which was opposite the second Bourne Bridge site, the ‘Railway Inn’ opened a few yards to the west. Its opening date is not known but it was certainly in existence by 1886 (see map below). At some time, probably in the early years of the twentieth century, the inn was demolished and rebuilt a few yards to the east incorporating much of the old cottage into the new build. A photograph from 1974 shows the two-storey inn with a single-storey wing to the rear that appears to be a large part of the original station building. Following the closure of Pampisford station on 6 March 1967 trade at the inn dwindled and eventually it closed. The building was demolished prior to the widening of the A11 and the building of a junction with the new A505 in the early 1980s. The first Bourne Bridge station building is extant. During the second half of the nineteenth century it was occupied by a local gamekeeper and remained largely unaltered until the present resident bought the property in the 1990s. 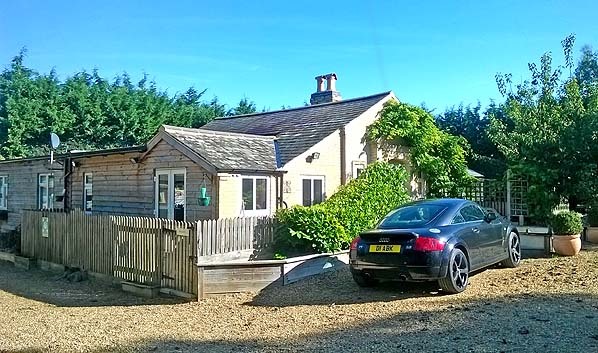 At that time it was gutted and a new cat-slide extension with a gable at right angles was built on the west side over what would have been the trackbed. During this work the original ticket window was uncovered inside the timber partitioned booking office which was still intact. The window has now been covered over and is not visible. During the construction of the A505 junction, Pampisford Road was realigned and the road surface passing the building was removed. 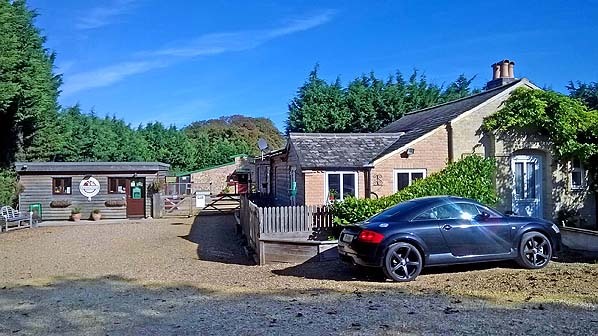 The station building is now within the Abington Boarding Kennels and Pet Hotel. Route map drawn by Alan Young. Tickets from Michael Stewart (except 3662 & 0060 Darren Kitson). N & C timetable from Great Eastern Railway Society. Looking north at the site of Pampisford Road level crossing and, beyond it, the first Bourne Bridge station. The decorated entrance door surround and pediment are trademarks of N&C buildings, and a similar entrance can still be seen on the two-storey station building at Cherry Hinton. The date of this photograph is not known. The Rokeby Collection dates from between 1930 and 1970 and this view is believed to have been taken in 1965-66. The track ran to the left of the building. It is not known whether Bourne Bridge had platforms; if it did they would have been short and low. This map is dated 1885 after the line was closed and the track lifted. The Newmarket & Chesterford Railway is, however, shown and both Balsham Road and Bourne Bridge stations are shown as a blob but not named as such. 1886 1:2,500 OS map shows the site of the first Bourne Bridge station. The station and track are not shown on any Ordnance Survey maps: the first edition 1" is too early and the second edition is too late. This map shows the trackbed and the station building, which was also the crossing keeper's cottage. 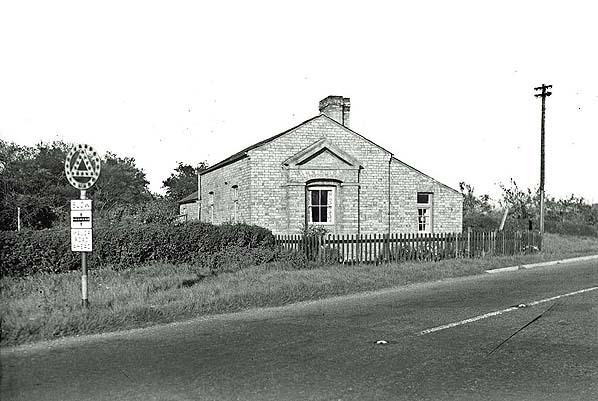 The first Bourne Bridge station building seen from the site of Pampisford Road level crossing c1960s. The extension to the rear of the building appears to be original as it is shown on the map above. The track passed to the left of the building and this was where the platforms would have been if the station possessed them. The ticket window was to the right of the window on the left side wall. Looking north from the site of Pampisford Road level crossing in October 2014 from a similar position to the picture above. Since the construction of the A505/A11 road junction in the 1980s Pampisford Road now stops at its junction with the A11, and the former road is now a private access drive to the Abington Boarding Kennels and Pet Hotel. A second cat-slide extension with a gable at right angles has been added to the west side of the building on the site of any platforms that might have existed. The house was substantially refurbished in the late 1990s but the trademark Newmarket & Chesterford decorated entrance has been retained. The surviving building at Pampisford Road has been extended in recent years. There is a second cat-slide on the west side with a gable at right angles which has a timber extension. These all sit on the trackbed (October 2014). The 1863 map was produced after the N&C was closed and the track lifted. 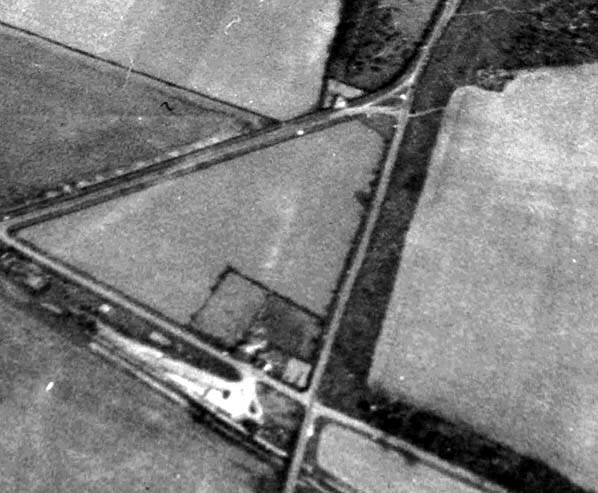 However it still shows the line, and the station at Bourne Bridge is shown at its second site and identified as a station. 1886 Ordnance Survey map shows the old station building/crossing keeper's cottage to the right of the Railway Inn. They are clearly two separate buildings at this time. 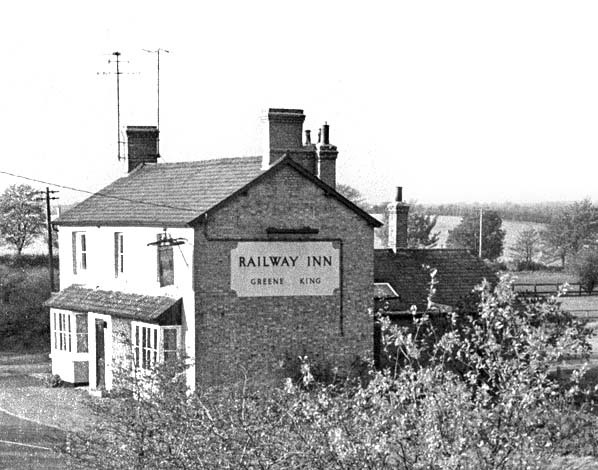 The ‘Railway Inn’ in 1974. The second Bourne Road station was incorporated into a rebuilt inn. The single-storey wing at the rear of the building could be the crossing keeper's cottage. 1:2,500 Ordnance Survey maps. The top map from 1903 shows the ‘Railway Inn’ and the adjacent station building and is much the same as the 1886 map above. At some time during the early years of the twentieth century the original inn building was demolished and a new inn was built a few yards to the east, incorporating the old station house. The bottom map shows the new ‘Railway Inn’ building superimposed onto the 1903 map. The old station building lines up exactly with the rear of the ‘Railway Inn’ indicating that much of the old building was used. The extension at the north end of the old station building was not included in the new structure. Modern aerial view showing the two station sites. The original station building, although now extended across the trackbed, still stands and is indicated by the top arrow. The site of the ‘Railway Inn’ is indicated by the bottom arrow. 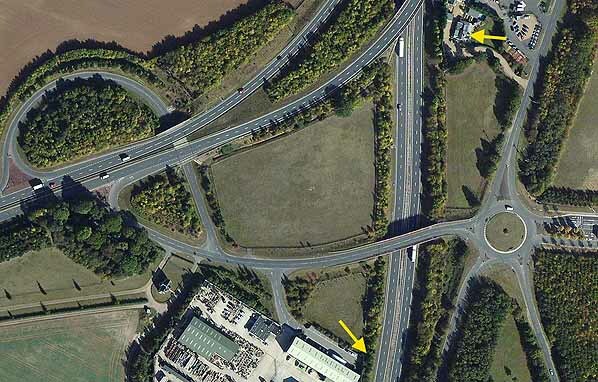 The site was lost during the widening of the A11 and construction of an improved junction with the A505. A remnant of Station Road survives as access to Solopark PLC which stands on the site of Pampisford station. Click here to see a larger version.